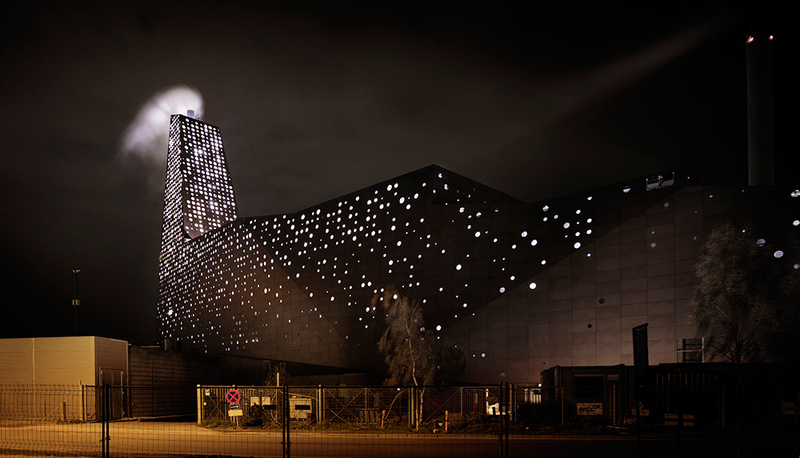 In 2011, Danish waste management company KARA/NOVEREN set out to replace two furnaces with a state-of-the-art waste-to-energy incineration line. Three years later the incineration line, or more popularly referred to as The Energy Tower, stands tall on the skyline of the Danish city of Roskilde, ready for its official opening today. Increasing demands to reduce CO2 emissions from fossil fuels calls for alternative energy production, and implementing a modern facility will allow KARA/NOVEREN to utilize the energy resources from residual waste that cannot otherwise be recycled. In line with this KARA/NOVEREN's vision was for The Energy Tower to become a new Danish landmark and naturally they wanted an energy efficient lighting solution to go with it. They envisioned a structure with the ability to communicate and relay messages of sustainable energy to the public. Located only a few hundred meters from one of the major inroads to the Danish Capital of Copenhagen, it has a huge reach and potentially thousands of spectators on a daily basis. The Energy Tower was designed by Dutch Architect and expert in sustainable design Erick Van Egeraat, who brought in Danish Lighting Architect Gunver Hansen to identify and implement the most optimal lighting solution. An extensive testing phase began to determine the best choice of fixtures. The requirements for these fixtures were very specific. First of all the lighting solution had to be able to reproduce the lighting concept created by Van Egeraat (described below). All fixtures should be individually controllable to give the building a dynamic expression. It was also crucial that the fixtures would be able to illuminate the relatively difficult projection surface, which was dark and very diverse. At the same time the lighting should be bright and powerful enough to be seen from a distance. Finally, of course there was also a desire for a low power consumption. Even before the construction process had started, various forms of testing was performed on surfaces that resembled the projection surface of The Energy Tower. Ultimately, Martin Professional’s Exterior range fixtures were chosen for the project due to their size, durability, and color reproduction capabilities. Van Egeraat’s vision for the lighting was for it to be an aesthetic contribution to The Energy Tower as a new landmark, and that it should signal the processes that take place inside of the tower and portray the combustion and energy making process. According to Gunver Hansen this was one of the more challenging projects of her career. The structure itself consists of a framing grid built around the new chimney. An amber-coloured aluminium plating is mounted onto the grid to form the exterior facade of the tower. The fixtures are mounted inside on the grid between the outer facade and the facade of the inner building, and the fixtures project onto the inner facade which is visible at night through the laser-cut circular openings of the outer facade. Many factors had to be taken into consideration, e.g. the distance between the exterior facade and the interior projection surface varies across the entire structure. Therefore each individual fixture had to be placed carefully so the colors would mix correctly and the output would be even. Also, as the direct view into the LEDs in the fixtures had to be avoided, a number of the projectors had to be screened off with a specially designed grid. Today, on its opening day (September 2nd), the tower is already a well-known landmark and the object of admiration for passers-by. Even though not officially open till today, spectators have already had glimpses of the building in lit condition. For example during the famous Roskilde Festival, The Energy Tower shone orange to mirror the official colour of the festival and its main stage. Part of the magic of KARA/NOVEREN’s new Energy Tower is its ability to alter its appearance with future lighting designs for special events, and that the lighting concept sends the message of waste-to-energy to spectators. It is an important message with global relevance.